Key words for this article: HFR = High Frame Rates. 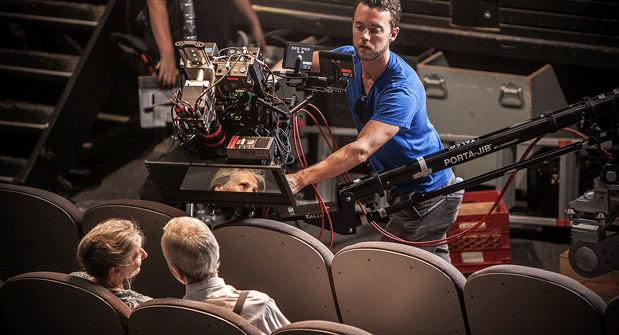 Traditionally, cinema productions are filmed at 24 frames per second, or for broadcast at 29.97 (30) frames per second. There are numerous advantages to filming in HFR, especially in 3D. Movies have been filmed and also projected at 24 frames per second since he 1920’s, and it has become widely known as a ‘cinematic aesthetic’. However, due to the slower shutter in recording frames at only 24 per second, certain motion artifacts such as blur and light strobing become visible. 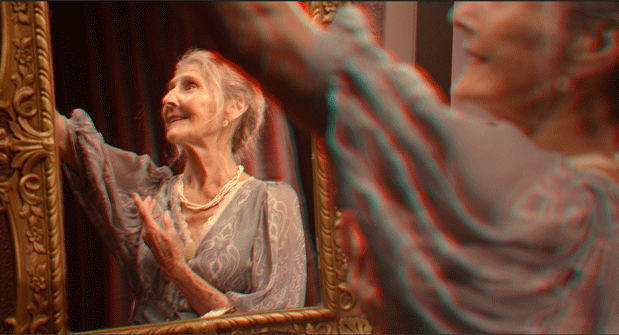 Motion artifacts are of concern in stereoscopic 3D productions, where they have been proven to increase viewer discomfort and promote a less immersive experience, the opposite of what most 3D productions are trying to accomplish. These motion artifacts are greatly reduced at higher frame rates, with the result not only a more comfortable viewing experience, but also one that demonstrates hyper-reality and smoother images. If you have a pair of red-cyan anaglyph glasses, have a look at the below image. “A window within a window”. On August 17-18th, staff from the S3D Centre directed the first variable rate HFR shoot of its kind with talented independent crew and cast members in Vancouver BC. “L’âme Soeur (Soul Mate) 3D” is a dual short film / applied research project that takes full advantage of HFR technology. Shot on the RED Epics on a motorized Kernercam stereoscopic 3D rig in both standard and high frames rates, we used the most recent advances in technology to investigate a question we have been studying for the past year: If technology were capable of capturing and displaying a complete narrative that incorporates variable standard and high frame rates, what are the creative benefits/drawbacks of doing so? Does the utilization of HFR as a ‘tool’ in this regard change the immersive experience for the viewer? We suspect that the question of whether or not to utilize HFR in a stereoscopic 3D film within a narrative context depends largely on the creative intent of the film itself. This short film was a means to explore this research. Initial research conducted in advance of this production consisted of a complete analysis of cameras, stereoscopic rigs, post production and display solutions that were capable of supporting HFR. 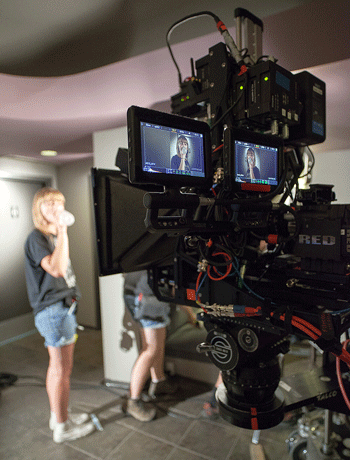 The RED Epics were chosen for their ability to shoot HFR at unprecedented resolution, and the ease of a RED workflow. We used our Kernercam 3D rig with Epic mounts which proved of critical importance due to its motorization of IA (inter axial), convergence, and focus. We were unable to find a display capable of HFR playback to bring on set, so we monitored on a consumer LG monitor in standard frame rates. Alan Goldman and myself (Denise Quesnel) had been present at NAB Show 2012 where we were in attendance at an HFR presentation. At the presentation, we observed Fraunhofer and Park Road Postdemonstrate stand alone clips at different frame rates. The clips had been created using a variety of interpolation and filming methods. An observation I made at the presentation was that it became difficult to appreciate the effects of HFR when clips were presented outside of a narrative context. If HFR is utilized to enhance and tell a better story, then I figured I would like to see it within a story. Yet there seemed to be unexpected push back from attendees at CinemaCon 2012 only a week later, when Peter Jackson and company presented 10 minutes of clips from “The Hobbit: An Unexpected Journey”. Once more, clips were presented outside of their intended narrative context and viewers had some very legitimate concerns over the footage. Comments ranged from ‘the shot with the actors talking was too realistic, it took me out of the immersive 3D experience and I was reminded I was watching a film’, to ‘the landscape and action shots were stunning and incredibly immersive.”. Douglas Trumbull has stated that HFR could benefit from being used as a selective tool, and we agree with his thoughts that some clips may be appropriate in 3D HFR and others not. Now that digital projectors exist, the firmware and software modifications needed to achieve this can be accomplished in time. For our experiment “L’âme Soeur (Soul Mate) 3D”, we decided to shoot every shot at 24 frames (standard), and 48 and 60 frames (HFR) rather than interpolate frames in software later. We wanted to know what actual HFR shooting would be like on set and with a direct comparable in post. 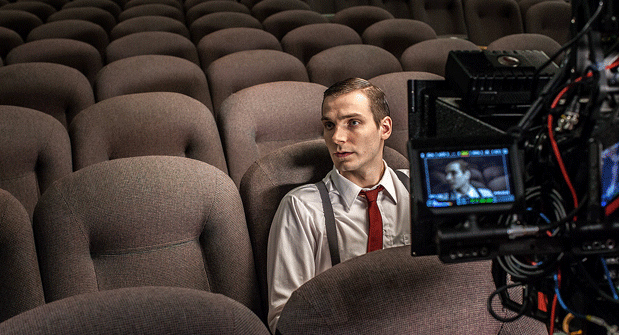 One concern was that switching frame rates between takes would be time consuming, but Emily Carr’s in house stereographer and research technician Sean Arden says “this is something that is common in film production for a variety of reasons, even 3d productions, one can achieve all sorts of different visual effects and tricks using higher frame rates, like super human speed illusion or time re-mapping. The only delay was in switching the output on the AJA Gen 10″ to keep the cameras in sync.” With the help of an experienced crew, including Director of Photography Oliver Millar and stereographer/camera operator David Tenniswood we were able to resolve the issues surrounding sync and the need for more light over the two day shoot. Filming HFR does require additional light, since the shutter remains open over less time as frame rates per second increase. A knowledgeable crew was key in being prepared for the need for additional lighting. HFR (High Frame Rate) Hand-Held with Kernercam 3D Rig and RED Epics from Emily Carr S3D on Vimeo. In looking at the initial footage, we are overwhelmed at its potential to build a better story and also be used as a scientific AND creative learning tool for 3D stereoscopy. We are already making early observations about how the various frame rates relate to one another and can be seen on their own. The next blog post will focus on the story of “L’âme Soeur (Soul Mate) 3D”, how it was written specifically to support variable HFR 3D production, and what post production tools currently are used to support (variable) HFR 3D.